Attorney General Jeff Sessions defended his record on the Russia investigation in a Time Magazine cover story published Thursday. He maintained that he had done the right thing in recusing himself from the probe. President Donald Trump has often feuded with Sessions about his recusal. Sessions maintained in the Time story that Trump is not above the law. Attorney General Jeff Sessions defended his role in the Russia investigation in a Time magazine cover story published Thursday. Sessions, who has often found himself at odds with President Donald Trump after recusing himself from the Russia probe, voiced his thoughts about the process to journalist Molly Ball. He said he stands by the move that has reportedly made Trump furious. 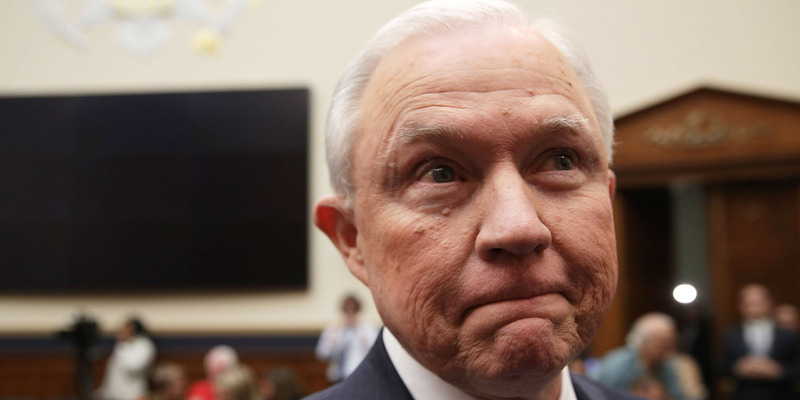 Sessions recused himself from the investigation in March 2017 after it was revealed that he had not disclosed contacts he had with former Russian ambassador to the US Sergei Kislyak during Trump’s campaign. Prior to his recusal, Sessions had reportedly recommended to Trump that he fire former FBI director James Comey, who had been heading up the Russia probe until then. Sessions has been maligned by Trump on numerous occassions. Trump publicly urged him to replace former deputy FBI director Andrew McCabe and has accused him of being disloyal. Sessions did eventually fire McCabe earlier this month on the recommendation of the FBI’s Office of Personal Responsibility, two days before McCabe was set to retire. The firing came after months of personal attacks by Trump against McCabe. According to Time, Sessions made an underhanded move to spite Trump before he spoke with Ball. He reportedly met with the US solicitor general and Deputy Attorney General Rod Rosenstein, who has been overseeing the Russia investigation since Sessions’ recusal. The trio’s symbolic protest reportedly infuriated the president. Time magazine itself has also attracted Trump’s ire when it didn’t make him its Person of the Year in 2017. Trump took the magazine’s honour in 2016 and some observers have suggested an “obsession” with the title. Trump’s criticisms of Sessions have more often than not focused on how willing he is to do what the president wants. But Sessions said although he is proud of his work with Trump and advancing his agenda, there are certain lines he says he won’t cross. “Congress passes a law, judges follow the law, and nobody’s above the law, including the judges, and including the president,” he said.